If someone who isn’t qualified to be driving a CMV is driving for you and they get into an accident that causes direct harm to others on the road, it isn’t the driver who is in trouble legally. It’s you. There are ways to learn about your potential hire to avoid the negative consequences of making the wrong choice. 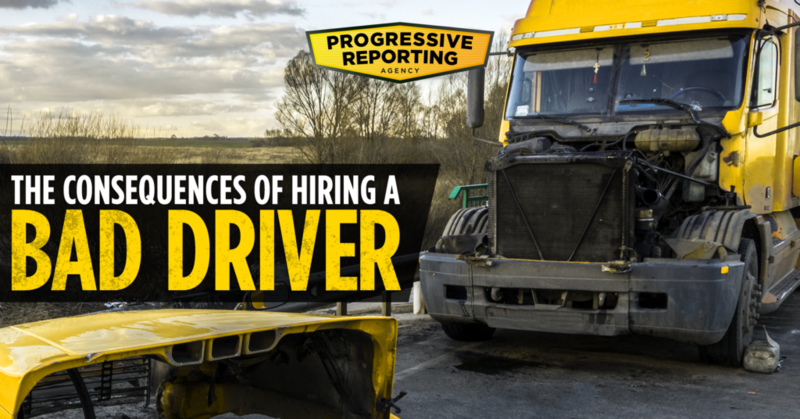 Here are a few resources you can use to make sure the driver you choose is the right one. Why Is the PSP Important? The PSP allows you to get accurate data on a potential hire. How you use the information you get is even more important. Even if someone has a clean report, it doesn’t mean you should automatically hire that person. Getting a PSP allows you to see who a potential hire’s previous employers were. It also gives you a chance to see your candidate’s past violations. It may be a good idea to ask your candidate about those violations during an interview to get an idea of whether or not a similar violation would happen again if they were hired. The data included is only for 3 years, but any DUI or drug-related charges are reflected on the report for 10 years. In most states, drivers can get a copy of their own MVR or companies can request an MVR as long as they follow regulations set by the Drivers Privacy Protection Act (DPPA) and the FMCSA. Unlike the PSP, the MVR only reports data from an individual state. Each state has different policies on what data they collect and how to obtain it, so make sure you go to the correct DMV site to get the most accurate data on a potential driver. Your driver’s safety habits are a reflection of your company and affect your CSA score, so make sure to have a system in place that rewards drivers for passing safety inspections. Many companies offer a small cash bonus for clean inspections. It’s up to you to decide what you can provide your drivers to reward them for doing good work. If you have any questions or want more help getting your company on the road, give Progressive Reporting a call. Or you can keep reading below for more tips on how to find and hire the right people. The better the job description, the more likely you’ll have qualified candidates apply to your company. Having a clear job description also makes it easier to sort through any resumes you get of who would or wouldn’t be qualified for the position. Are there specific benefits your company offers that others might not? Do you offer training to new drivers? How much is a starting salary? How much home-time can someone expect? How much experience do you want your new hires to have? Make sure you make it clear why someone should apply to work for you and not someone else. Be honest and don’t exaggerate your benefits. Even if you find the right person, they might not want to stay if you don’t provide what they’re looking for. When interviewing potential drivers for your company, don’t stick to basic “yes” or “no” questions. Instead, ask a variety of questions, ranging from basic work experience to what the potential employee would do in hypothetical situations. Truck driving is more than just driving a truck. It’s important to have the skills necessary to communicate with others, whether it’s dispatch or with other members of their team. Use the interview to see if they have the skills necessary and the right personality to work for your company. While there is a trucker shortage, that doesn’t mean you should settle for less. If someone doesn’t meet your requirements, don’t hire them! Remember, it’s your company’s reputation that’s on the line if your driver breaks safety violations. Keep your company and others safe by not employing reckless drivers. Hiring drivers is just one aspect of running a trucking company, but there’s a lot more that goes into it. If you want more resources on how to start your own company, you can check out this post or download our free guide. We’re also available to help walk you through everything you need to start your own business, so don’t hesitate to give us a call!